General elections were held in South Africa on April 27, 1994. They were conducted under the direction of the South African Independent Electoral Commission (IEC). 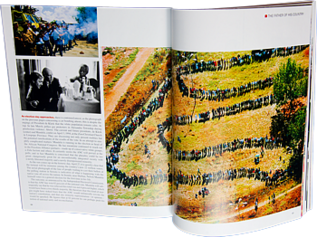 The election marked the conclusion of a four-year process that ended apartheid in South Africa. This election was historic in that it was the first in South Africa in which citizens of all races were allowed to vote. The date, April 27th, is now a public holiday in South Africa, celebrated as Freedom Day. Millions queued in lines over a three-day voting period. As expected, the African National Congress (ANC) won a sweeping victory. The ANC party took 62% of the vote, just short of the two-thirds majority required to amend the Interim Constitution in place at the time. As required by that document, the ANC formed a Government of National Unity. The new National Assembly's first act was to elect Nelson Mandela as President. South Africa used a proportional representation voting system based on political party lists at the national and provincial levels. A registered political party receives a share of seats in Parliament in direct proportion to the number of votes cast in the election. Voters do not vote for individuals. They vote for a political party, which decides on members to fill the seats it has won. Provincial Ballot - for the election of the 430 members of the nine provincial legislatures. The ballots were printed on paper and bound in books of 100 ballots. Each ballot has a unique serial number printed in the upper left margin. Each ballot has the IEC watermark in the background. Each ballot has voting instructions in 11 languages: English, Sotho, Swazi, Tsonga, Tswana, Ndebele , Afrikaans, North Sotho, Venda, Xhosa and Zulu. The Inkatha Freedom Party (IFP) entered the electoral process late, after the ballots had been printed. 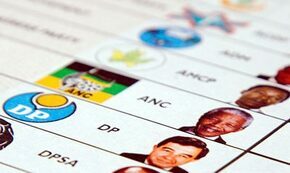 To include the IFP in the election, stickers had to be printed & attached at the bottom of each National & Provincial ballot. The stickers were attached by poll workers. The National ballot has 19 political parties listed. Weeks after the election, South African government officials placed the remaining unused ballots up for sale. Norris Barker, an Arizona-based entrepreneur and school teacher, made news in 1994 when he purchased the surplus ballot papers put up for sale by the South African government following the elections that resulted in Nelson Mandela becoming that country's first black president. The ballot papers, which are symbols of that historic event are now collectors' items and are in a limited supply. Get your authentic ballot before they are all gone! Above you can see section of the ballot where Nelson Mandela is listed. Notice the watermarking included by the CIE to verify ballots were authentic. The area highlighted above right in red is shown in a larger view at right. The letters IEC are repeated in black and look like a vertical gray stripe when viewed from a slight distance. There is a similar strip along the left side of the ballot also highlighted in red. At left you can see a zoomed view of the green area marked on the ballot. This shows the background watermark that covers the majority of the ballot along with the flag for Mandela's party, the ANC.